The central enquiry for analysis by this Study is whether ICAO is the most appropriate international organization to regulate the rapidly expanding global space activities, particularly from the space safety perspective. 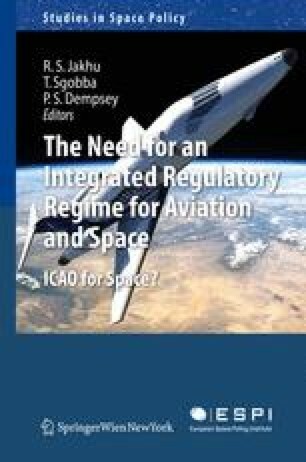 In order to respond to this question, the Study discusses and examines (a) the origin, mandate, structure and functioning of ICAO; (b) the nature, scope, magnitude and trends in space technology and its applications; (c) the regulatory regimes and organizations analogous to those for space activities and (d) the rationale for ICAO’s possible involvement in the development of an international regulatory regime governing world-wide space activities, starting with space safety matters. “Galileo andEGNOSto drive future road management systems,” 19 April 2010, online: http://www.gsa.europa.eu/go/news/galileo-and-egnos-to-drive-future-road-management-systems (last accessed: 03 January 2011).